As a kindergarten teacher I have the opportunity of starting off my school year meeting with each student and their parents prior to the first official day of school. I give the student a short assessment on pre-kindergarten standards and then I talk with the parents about school and kindergarten expectations. This year I had one particular meeting with a parent who did not speak English. Her daughter was bilingual but she, the mother, could only communicate in Spanish. No translator was on hand so we were forced to pick our way through our conversation with hand gestures and a mixture of English and Spanish words. There were a few laughs here and there from misinterpretations but neither of us became frustrated in our feeble attempts to understand each other. After the parent and her child left, I couldn’t get over how impressed I was with this mother. I didn’t understand her and truth be told I didn’t understand most of her hand gestures either. However, her desire to be involved in her daughter’s education despite the language barrier made it clear that she was a mom that was going to be present in her daughter’s education. I think of this woman and I think of my own mother, an immigrant from Tonga. What awkward conversations did she have with teachers just to ensure for me a path through education that would find me successful in the end? I think of this woman and I hope that the education system will not fail her. Heavy on my mind are the obstacles that stand in her way; cuts in the education budget, laws that affect the quality of teachers hired to prepare our children for adulthood; standardized tests that marginalize children with specific learning needs. I think of the countless parents and providers across this nation and I know that this is their struggle. And that’s just where education is concerned. What other areas of our lives are we trying to communicate our needs but a barrier hinders us from being understood? We can no longer sit on the sideline and allow others to determine the destiny of our country or the future of our children. We can no longer opt out of participating in the political sphere or engaging in our civic duty to vote because when we do we allow the decisions that affect our everyday life to be made for us. We allow the future and destiny of our children to rest in the hands of others who may not have their best interest in mind. Whether we realize it or not, whether we want it to be that way or not, so many things are dependent upon the way this country is run and who runs this country. I look at my students, I look at our community, I think of our future, and I realize I can no longer afford to let someone else speak for me. Whether we speak the same language as those who write the laws or govern the land, whether we use hand gestures, the written word, or whether we can even speak at all, our future is ours to decide. So be present, take part, speak up, and decide. Veanna Pau’u was born and raised in West Valley City, Utah. She attended Hunter High then went on to study and graduate from BYU Provo. She is a kindergarten teacher at Mana Academy where she loves teaching as well as learning from her precious students. She loves spending time with her two nieces, her brothers, and parents. Veanna attributes her sense of civic duty to her concern for her community and family. Interested in sharing your story? Contact us for more information on how you can be featured in our Op-ed Series. Chances are you’ve heard some of these names before: Dwayne “The Rock” Johnson [Actor/Entertainer], Dinah Jane [Member of Fifth Harmony], Troy Polamalu [Pittsburg Steelers, Retired NFL Player], Jabari Parker [Milwaukee Bucks, NBA Player], and Jason Momoa [Actor]. While these celebrities have Pacific Island heritage in common (a fact that many of us Pacific Islanders enthusiastically proclaim), their celebrity makes them an anomaly in a relatively invisible community. The Native Hawaiian & Pacific Islander (NHPI) population in the United States (U.S.) is small and unique, and as a result, there are unique challenges that are largely invisible to the mainstream. Native Hawaiian & Pacific Islanders make up less than 1% of the U.S. population, however according to research completed by the Asian Americans Advancing Justice organization this year, within a 5-year period (2010 and 2015) the NHPI population grew by 13 percent. That’s currently the second fastest growing group in the U.S. behind Asian Americans. HEALTH About 1 in 7 NHPIs nationally are uninsured, a rate higher than Whites (also Tongans, a NHPI ethnic subgroup, have a rate of about 1 in 4 that do not have insurance). ECONOMIC JUSTICE & HOUSING In Utah, NHPIs fare worse than average across multiple measures of income: Poverty rate (15% compared to 9%), higher proportion who are low-income (53% compared to 27%), and lower per capita income ($12, 446 compared to $24,895). NHPI have lower-than-average rates of home ownership in the Salt Lake City area (49% compared to 71%). IMMIGRATION Overall, NHPI subgroups have different relationships with the U.S. (i.e. – U.S. citizens, U.S. nationals, COFA, and no U.S. association), this makes the topic of immigration complex and challenging to fully comprehend. There are many more issues that affect the NHPI community not listed above, but what can be done about it? What is our responsibility as a community if we want to see change? Making change is easier said than done. We have to make time during our busy lives of work, school, religious duties, family and community responsibilities, etc., to learn about the issues facing the NHPI community. If we don’t care enough to learn about what’s going on in our own community, we can’t expect someone else to, and we can’t expect things to improve. To better understand the issues that surround the NHPI community, we have to get involved and volunteer with work already being conducted by NHPIs in their communities. We will also need to do as Fitisemanu suggested and find time to speak out so that these issues are addressed. One way to ‘speak out’ is to register to vote. In 2012, there were only 58% of NHPIs registered to vote compared to 71% of the total U.S. population. We are traditionally a resourceful and resilient people. If we want our issues to be addressed, it’s our responsibility to not be ignored or have our issues be easily forgotten. Our parents, grandparents, and family that came before sacrificed and found ways to provide for us. We must pay it forward and remember our future generations. If we do not make the necessary changes today to better the NHPI community, we will be providing our children with challenges and struggles because of the resources (or lack of) that will be available to help them survive. 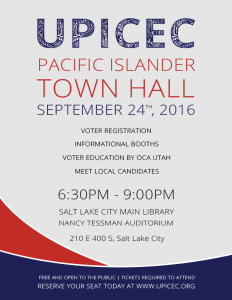 We are excited to announce our 2016 Utah Pacific Islander Town Hall Keynote Speaker, Sefa Aina! 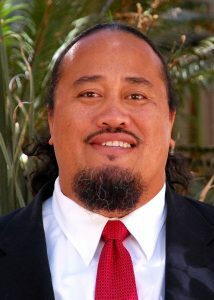 In addition to the incredible work he does as Associate Dean and Director of the Asian American Resource Center (AARC) at Pomona College, Sefa serves as Board Chair for Empowering Pacific Islander Communities (EPIC). We are honored to have Sefa share his inspiring message with us on Saturday, September 24th at the Salt Lake City Public Library. Admission is FREE, but seats are limited. Reserve your tickets today! When my dad left Samoa there was no such thing as universal suffrage, so when he became a US citizen he took his civic duty to vote as seriously as his family, faith, and career. I work a nine-to-five job, I do the dishes and take out the trash, and I enjoy my wife’s cooking. I usually pay my mortgage and bills on time, I take my daughter to the bus stop, and I have four chickens in my backyard. I walk to the corner store and see that a few street lights are burned out. I notice some streets around here don’t even have sidewalks. I hope some “political person” fixes all that. I curse on my way to church as I swerve to avoid yet another pothole. I can’t believe they’re developing that piece of land when it would be a perfect site for a public playground. I bet a “political person” could have done something about that. I want to be more involved in my daughter’s education. I hope our neighborhood watch patrol isn’t racially profiling our own neighbors. I went to a city council meeting last week. I wonder if a “political person” would do this kind of stuff too. I register to vote and I know where our polling place is. I attend our neighborhood caucus and I’ve even corresponded with my congresswoman. Am I a “political person”? I now realize that everything around me involves politics… from small businesses and potholes, to law enforcement and sidewalks… from city parks and freedom of religion, to street lights and property taxes… from my daughter’s Kindergarten curriculum to the painted crosswalks she passes on her way to the bus stop… from my Netflix subscription to how many chickens I can own within city limits. I now see that every facet of our daily lives is impacted by political decisions being made at federal, state, county, and local levels. I now understand that if we don’t speak up then we leave all the decision-making up to people we barely know, to career politicians, paid lobbyists, self-interested bureaucrats, and big industry bosses. We can all have a voice in the decisions and policies that impact how we live, how our taxes are spent, the environment our kids are growing up in. We can make a difference. We can honor the sacrifice of our parents and grandparents who brought us here, not just to be passive recipients, but proactive participants in the American dream. We have to stop worrying about being “political” and work on becoming involved, informed, and engaged. I am not a “political person”… and I don’t have to be to make a difference. Jake Fitisemanu was born in New Zealand and grew up in Hawai’i and Utah. A graduate of Westminster College, Jake is the chair of the Utah Pacific Islander Health Coalition and the manager of the UDOH Health Clinics of Utah. He credits his strong sense of civic duty to his parents, who have exercised their right to vote in every election since moving to the USA. Jake lives with his wife and two daughters in West Valley City.